Orman’s entry into the race presents a major obstacle to Democrats, who had hoped to lure the same moderate Republicans away from Kobach, a favorite of President Donald Trump because of his fervent support for tough immigration and voter ID laws. The secretary of state’s office posted a short statementsaying Orman had presented enough valid signatures to qualify for the ballot in November. Orman, 49, will face Democratic State Sen. Laura Kelly of Topeka and Kobach, whose nomination was only settled this week after Gov. Jeff Colyer conceded in a primary with a razor-thin margin of some 350 votes out of more than 316,000 cast. “I think there are lots of Kansas Republicans who view Kris Kobach as not only extreme but incompetent and corrupt and I think those Republicans … will be very attracted to my background,” Orman told The Associated Press in an interview after the announcement. Democrats were gearing up for a potential legal challenge to Orman’s certification. 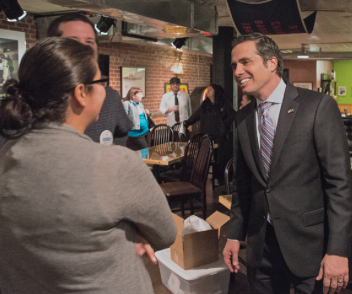 Many Democrats have worried that Orman will pull votes away from Kelly, 68, making it far easier for the 52-year-old Kobach to win with less than a majority of the vote. Orman made the ballot by submitting more than 10,000 signatures in early August. He needed 5,000 valid signatures to qualify. During the 2014 Senate race, Orman described himself as “pro-choice” and said abortion policy was a matter of settled law and the nation should move on. Orman’s running mate John Doll is from Garden City and left the Republican Party to run for lieutenant governor.